The Poe House tour explores the empty space of the house as well as phantom black cats, the walled-in window, and surprise-whispers revealing Poe’s continuing presence. The glory of man, and something more than his glory, is to waste his powers on the void… Thus it would seem that the history of thought can be summarized in these words: It is absurd by what it seeks; great by what it finds. “I do not wish to fill the Poe House with facts, or ideas. Nor something more than facts and ideas, only to keep the empty house empty and open to possibilities.” With these words I began the Empty House Tour of the Edgar Allan Poe House in Philadelphia. The Empty House Tour lasted for two weekends and was part of a series of events called “The Big Nothing,” sponsored by the Institute of Contemporary Art in the summer of 2004. It was on a pilgrimage to the Poe House, a full year before the tour, when its emptiness first caught my imagination. On this visit, the house’s most intimate and most public secret was revealed: the house was empty. Completely empty actually. At best this drab dwelling was a shell, which was not a complaint, but in fact its most singular and compelling feature. The official Poe House tours are given by knowledgeable National Park Rangers. Visitors are urged to visualize what the house was like when Poe lived there with his wife and mother-in-law for a single year between 1843-1844. But as I planned my own exploration, I wanted to try to see what was actually in the six spare rooms right now, instead of what was, or was not, there when Poe rented the residence. The enigmatic house would eventually become a new way for me to approach Poe’s tales, essays, and poems. In fact, I now believe his empty house, officially known as the Edgar Allan Poe National Historical Site, is well suited to its purpose, and stands as one of the greatest commentaries on Poe’s work. The Poe House, located at 530 and 532 North Seventh Street, is actually two houses that have been combined. Located at 7th and Spring Garden, the site is separated by an industrial corridor at the far north edge of Center City. Directly up the block on Spring Garden is Robert Venturi’s self-consciously ugly and ordinary low-rent retirement Guild House with its well-known GUILD HOUSE sign rendered in giant red supermarketstyle lettering. One block north of the Poe House is a city housing project called the Spring Garden Houses. Poe’s literal house is located at the 532 N. 7th address; 530 N. 7th was acquired at a later date and is used by the National Park Service for several purposes: a visitors’ lobby, a small screening room, a side living room library, and Park Ranger office space. Most Philadelphians have never been to the Poe House. In fact, few people know it is there at all. Not surprisingly, the front door is always kept locked. Even during regular hours the door remains bolted. On an early visit I remember standing on the shoe-worn old stone steps wondering if the museum was even open. I had rapped several times with the doorknocker when, after an evident pause, I heard someone approach to unlock and open the door. The National Park Ranger welcomed me in, and another Park Ranger about my height and build strode up to me smiling. I was surprised to hear the Park Ranger say my name. He turned out to be a childhood friend named Andrew McDougal. I was very happy to see him after so many years. We spoke of old friends, summer-long games of stick-ball, and punishing crab apple wars on our block in Northeast Philadelphia. As we talked I noticed book shelves in the right corner displaying a small but well-chosen selection of Poe’s books and Poe scholarship including: Daniel Hoffman’s classic Poe Poe Poe Poe Poe Poe Poe, the first-rate Library of America editions of Poe’s work, and an assortment of the Dover editions. Set back at the entrance stood a large wooden teacher’s desk, where Andrew’s supervisor, the Unit Sites Manager Steve Sitarski, sat doing paperwork. All manner of information and official Park Service pamphlets were also arranged upon the desk along with a large black leather guest book, which I signed. After much conversation Andrew gave me his card and I set off alone. I walked over to the threshold of the actual Poe House. I stepped down into the parlor. Once inside the house it was as though I was stepping onto the crumbling pages of my paperback edition of Edgar Allan Poe: Selected Prose, Poetry, and Eureka. Mine was the Rinehart Edition (seventeenth printing), edited by W.H. Auden and first published in 1950. Like the house, my book was well-worn and handled. Its pages resembled dematerializing parchment paper. Its borders were badly faded. 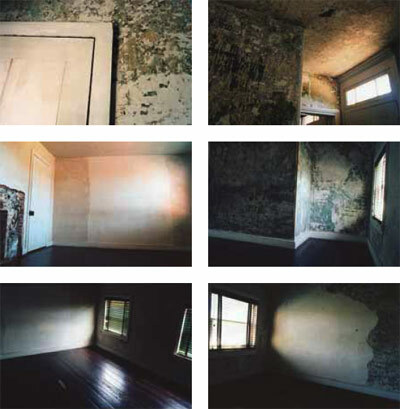 The walls of the house had been scraped down to that region where generations of paint and wallpaper blurred into a whorl of plaster: endless varieties of chalk, crystallized blues, and a matte rosy film swirled over it all. The Poe House is in a state of preserved dilapidation. Though it is ahistoric museum, thrillingly the house feels as if the velvet ropes have been removed between you and the rooms. And there you are—no one standing between you and crumbling walls, which rub easily off into your hands. Since 1978, the Poe House has been maintained as a National Historic Site. The site is staffed by a team of dedicated National Park Rangers whose charge it is to educate visitors about Poe’s work and his short and disorderly life (1809 -1849). Starting in 1843, Poe rented the house for a difficult but fruitful year. He was thirty-six years old. He referred to the house as his “rose-covered cottage.” While Poe lived here, he published a number of his most notable stories, including “The Tell-Tale Heart,” “The Fall of the House of Usher,” “The Black Cat” and “The Gold Bug.” Famously nomadic and chronically poor, Poe lived in five different houses during his six-year stay in Philadelphia. The National Historic Site is his only Philadelphia residence still in existence. Over a span of four months I began visiting the house to hash out plans for the Empty House Tour. I immersed myself in most of Poe’s forceful, highly stylized and permanently strange tales, poems, reviews and letters. I was grateful to the Park Rangers for their professionalism and efforts to show connections between Poe’s everyday life and his work. Still, I had some skepticism. How much could the house really tell me about Poe’s work? And how much could the work really tell me about the house? What was most captivating for me about Poe was not how he depicted daily life, but how he turned so conspicuously away from the things of his everyday life via the imagination. Still, strangely or not, I was beginning to love Poe’s empty house as much as the extravagant visions of his work. ... calm block fallen here on earth from a hidden disaster, let this granite at least for ever show its boundary to Blasphemy’s dark flights scattered in the future. As I planned the tour I was insistent that I’d use the house to let my imagination wander wherever it may amid what seemed to be an inexhaustible emptiness. But emptiness comes in degrees. And the more time I spent in the house the more I forgot it was empty. In addition to the basement, Poe’s row house (aptly called a trinity) is three stories tall: on the first floor, the parlor and kitchen; on the second, Poe’s room and a small side room, perhaps his study; on the third, his wife Virginia’s bedroom and her mother Muddy’s bedroom. Last, there is the unfinished basement, which is essentially the soul of the house itself. When asked if there were any questions, one woman wanted to know if Andrew and I were brothers, or related. As we stood before the group, the woman went on to say how uncanny it was to see us both side by side as our features were so much alike: similar height, same build, the same brown clean-cut hair, and blue eyes. As in Poe’s tales, every detail served to feed the tour. On realizing our physical resemblances, I launched directly into a discussion of the double in Poe. He makes considerable use of doubling devices in tales such as “Fall of the House of Usher,” “The Man of the Crowd” and “The Black Cat” to name a few. Roderick Usher murders his twin sister and also kills himself. Poe’s black cat is a double of another black cat that haunts his narrator and also comes to its own horrific end. I also drew on what I believed were more explicit connections between McDougall and myself, including that we both grew up only six houses away from each other on the same block. My evil destiny pursued me as if in exultation, and proved, indeed, that the exercise of its mysterious dominion had as yet only begun. Scarcely had I set foot in Paris, ere I had fresh evidence of the detestable interest taken by this Wilson in my concerns. Years flew, while I experienced no relief. Villain!—at Rome, with how untimely, yet with how spectral an officiousness, stepped he in between me and my ambition! At Vienna, too—at Berlin—and at Moscow! Where, in truth, had I not bitter cause to curse him within my heart? From his inscrutable tyranny did I at length flee, panic-stricken, as from a pestilence; and to the very ends of the earth I fled in vain. The emerging coincidences between McDougall and myself triggered an unexpected sensation of reading a story to find yourself in the very story playing out before you on the page. It was Poe, of all writers, who exploited such devices as a part of what he called the “totality of effect.” Yet, the more I thought of doppelgangers pursuing doppelgangers, the more hesitant I felt about fully embracing the idea that Park Ranger McDougall and I were actually each other’s doubles at all. But once it was mentioned there was no taking it back. If I knew anything about Poe I knew no good could come of avoiding the double issue. In calling Andrew my double in good faith and good fun, which I did, I hoped to avert any major mishaps given the damning track record of doubles in Poe. Yet, it was also in moments like this—face to face with McDougall—that the tour became what I most hoped it would become, ending up in places that no one had dreamed, or predicted. To the end, both Park Ranger McDougall and I kept each other alert and on our toes. Before I realized it, the tour was underway. From the screening room, the group quietly filed out one by one into the parlor of the Poe House itself. In the front parlor I began the tour with the following speech: “I wish to keep the empty house empty and open to possibilities…” I also addressed the following question: why is the Poe House apt for Poe’s work? I pointed out just how many Poe stories take place within a single room, or a series of rooms, or their innermost and secret recesses. Poe’s house, as in so many of his tales, also increasingly feels more and more enclosed. Each floor is literally smaller than the next. The house is also set apart and separated from Center City proper. Many of Poe’s tales take place at the edge of a city. The group left the parlor and crowded into the small back kitchen. After several minutes of silence and looking at the walls, I asked and gestured for the group to follow me to the second floor. We walked up the narrow middle stairway to Poe’s room. Here I invited everyone to take a seat on the floor facing the east wall. From my first encounter, I was struck by a 4 x 8 foot plastered-over section of the wall. I learned that there had once been a window there until an addition was built onto the house (I suspect that looking at a number of paintings by the Abstract Expressionist artists over the years may have also helped to signal something that might otherwise have been nothing). This luminous plastered middle section of the wall had the presence of a Rothko painting, though it was more dissolved and understated than any Rothko. It held an almost invisible light on the surface of its smooth matte plaster. It was like a wide door; well, no, it was really like a big blank screen, or a domestic fresco. I was enticed by what I would come to call the “walled-in window.” After two months of ruminating on the wall I made plans to use the space to project an imaginary slide show, or what came to be: a make-believe PowerPoint presentation. While introducing the imaginary slide show I noticed people start to turn around to look for a projector. There was none; only Park Ranger McDougall standing in the doorway, and (when they turned back around) me standing on the opposite side of the room in front of the mysterious blank wall. THOMAS DEVANEY is a poet and the author of A Series of Small Boxes (Fish Drum Press, 2007). Projects and collaborations with the Institute of Contemporary Art (Philadelphia) include: a performance “No Silence Here, Enjoy the Silence,” for the “Locally Localized Gravity” exhibit (2007); a collaboration with Troy Brauntuch for the “Springtide” exhibit (2005) Letters to Ernesto Neto (Germ Folios, 2005), a collection of letters written to the Brazilian artist Ernesto Neto, with an afterword by Neto. Devaney is currently a Penn Senior Writing Fellow in the English Department at the University of Pennsylvania.